Your Donations help us care for animals in need. These are some of the items we need to run our shelter. If you are able to donate anything, please contact us at [email protected] to arrange for pickup or delivery. Thank you so much for your help. It is truly appreciated. Gift Cards for local pet supply stores, such as Pet Supply Plus, Petco, etc. 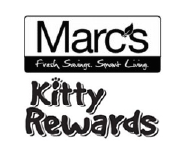 Lucky Paws thanks Marc's and the Ohio Pet Fund for grants. The Ohio Pet license plates are vehicle regisration tags that raise funds for education and the spay/neuter of cats and dogs. Lucky Paws is an Ambassador with the Rally to Rescue® program. Through the program, Purina® Pro Plan® brand pet food supports pet rescue organizations across the country to help give rescued pets the nutrition and care they need and the loving homes they deserve. Click here to learn more!